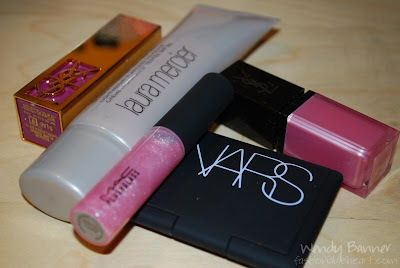 So here are my swatches from the haul that I showed yesterday! ^ The Laura Mercier tinted moisturizer in Porcelain. The left swatch is heavily applied and the right side is blended in. I'm a NW20 in MAC and this works well for me. 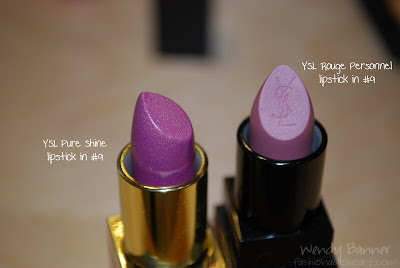 ^ The closest I had to the Golden Violet shade (Rouge Personnel #9) is MAC's Purple Rite lipstick. And to be honest, I prefer Purple Rite. Golden Violet is more glitter than color on my lips. I don't know how I forgot to take a picture of the Bountiful Plushglass aside from the group shot, but I managed to do so. Oops! It's an ok gloss...but more glitter than an actual pale pink shimmer. ^ NARS Bysance eyeshadow duo. This along with the tinted moisturizer is my favorite of my purchases. It hasn't gotten great reviews, but I don't see why. I absolutely love the purple color, which is mainly the reason I was attracted to the duo. And these are nicely pigmented! Love the look of this eyeshadow. Both colours are so pretty and seem to be really pigmented. I've ordered from Strawberrynet a couple of times but am very impatient and always want to get my stuff asap :-P so don't know if I'll be buying from them again (took 3-4 weeks).